February is American Heart Month, so I explored my public library’s catalog for heart healthy lifestyle books to review for Weekend Cooking next month. I found so many that I can start this month! Summary: The first seventy pages of the Eating Well for a Healthy Heart Cookbook form a primer of heart health, covering the risk factors and how to reduce the risks through diet, exercise, and other lifestyle changes. No new information to someone who has made a hobby out of reading healthy lifestyle books, but I like that it is complete, succinct, and engaging with lots of lists, sidebars, and diagrams. The rest of the book is as pretty of a cookbook as you could want. Many recipes are two page spreads with gorgeous photos. Each recipe has nutrient information, icons for things like “lower carbs,” and a bold notation for the active time and total time to prepare. Some recipes are labeled “Makeover” and contain notes about how this recipe, say meatloaf, differs from conventional recipes and why those changes, say substituting lean ground beef and turkey, make it healthier. These tips can be used to make other recipes more healthful. Thoughts: We made the Fried Fish Sandwich (pp. 80,81), one of the Makeover recipes that pan-fries instead of deep-fat frying, uses a reduced-fat coleslaw as a condiment instead of tartar sauce or creamy coleslaw, and adds pineapple for flavor and nutrients. I made several changes to make this work better with my all-natural goals. The original dressing was half reduced-fat mayo and half yogurt. I changed that to one-quarter full-fat mayo and three-quarter yogurt cheese (strained yogurt) which has a nicer texture for dressings without adding either fat or unnatural ingredients. I bought a fresh pineapple — they are beautiful right now — instead of using canned. I shredded cabbage and carrots rather than buying a coleslaw mix, prepping the cabbage in the method I learned in Mark Bittman’s Food Matters. I made my own “Cajun seasoning” from spices in my pantry and left out the salt because I salted the cabbage and used seasoning salt in my mix. Our cooking oil of choice, these days, is 100% pure olive oil rather than the more highly processed canola oil featured in the recipe. Also, I halved everything because there are only two of us, and we made the fish servings even smaller because it looked like too much meat to us. The recipe states that it has 684 mg sodium. I’m guessing most of that came from the commercial bread they used. The discussion of sodium at the front of the book suggests a target of 2300 mg a day, so if that’s your goal, I guess that nearly 700 at dinner isn’t too much. The high blood pressure section, however, also mentions the DASH diet which shoots for 1500 mg or less a day which is closer to my goal, so I can’t have 700 mg in one meal. Baking my bread in a bread machine has been a terrific way to reduce sodium — commercial bread actually tastes salty to me now. This was a delicious sandwich with nice contrasts between warm fish and cold slaw. The pineapple added a lovely sweet note. The sandwich made a satisfying supper alongside a salad. 1. Stir mayonnaise, yogurt, vinegar, and crushed red pepper in a medium bowl. Add pineapple, carrots, and cabbage and stir to combine. 2. Place cornmeal in a shallow dish. Sprinkle both sides of fish with seasoning mix. Dredge the fish in cornmeal. 3. Pan-fry the fish in olive oil, flipping once, until golden on both sides. Rick covered the pan with a lid for a minute or two as it cooked on each side to reduce splatter and to encourage the fish to cook from the inside out. 4. 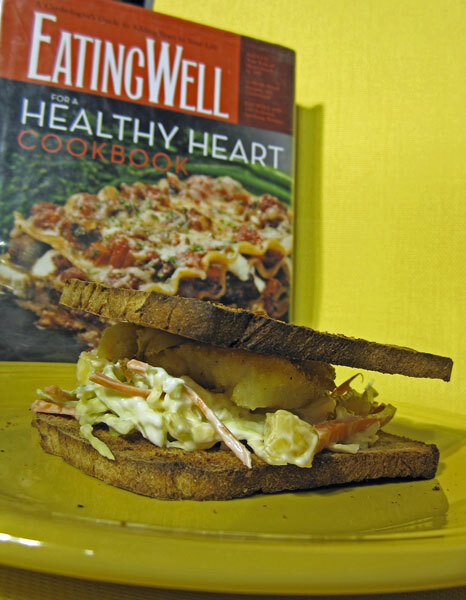 Top toasted bread with the fish and pineapple slaw to make sandwiches. Serve immediately. Appeal: The Eating Well for a Healthy Heart Cookbook will appeal to home cooks looking for healthier recipes. The Makeover recipes are especially good for people wanting to update their favorite recipes to healthier versions. Besides meatloaf and fried fish sandwiches, look for makeovers of lasagna (see cover photo), waffles, pepperoni pizza, tacos, and others. Challenges: This is my first book for the Foodie’s Reading Challenge for 2011. And, this is my post for the Weekend Cooking meme, click through to see other bloggers’ cooking adventures. Your sandwich looks so delicious. I love a low-fat coleslaw on sandwiches. It makes a sandwich feel so full and rich. With the addition of pineapple, this is special. I’m going to give this a try. My husband is especially fond of fish sandwiches. He’s due for a treat. I’ve been trying to eat healthier. This cookbook is calling my name! Love the idea of pineapple in the cole slaw. Great looking sandwich. Have made fish sandwich before and liked it so much better than the fast food version. that sounds very good, especially the coleslaw with your changes. Is March Chocolate Chip cookie month? My birthday is in March.